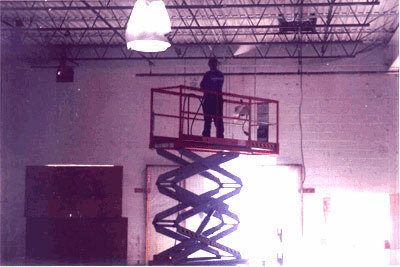 Typically the ceilings and walls of a factory, warehouse or shop become a collection place for airborne debris, dust, carbon and other contaminants. We provide cleaning of these areas using either wet or dry methods. This is usually determined by the surrounding environment of the area being cleaned and how sensitive the area is to detergents and water. If the ceiling or wall areas do not have a lot of electrical components then typically they can be cleaned using a detergent application and hot water pressure rinsing. This does require us to first prepare the area by covering outlets, switches and minor electrical components with duct tape and poly protective plastic. After the cleaning takes place all areas are uncovered and hand wiped as needed. If the ceiling or wall areas are too sensitive to moisture then we will utilize a dry cleaning method. Usually this involves the use of blowing down the surfaces with air and wiping heavily soiled areas with rags and a citrus detergent. Vacuuming surfaces to remove carbon, soot and dust is also used in areas where wet cleaning is unsafe to use.